Since last weekend’s violent flash floods ripped through several small western Tennessee communities, volunteers and the American Red Cross have been working to help affected families clean up and try to rebuild their homes and lives. There have also been numerous local relief groups lending a hand in communities such as Dover, Erin and Clarksville as well as several churches. 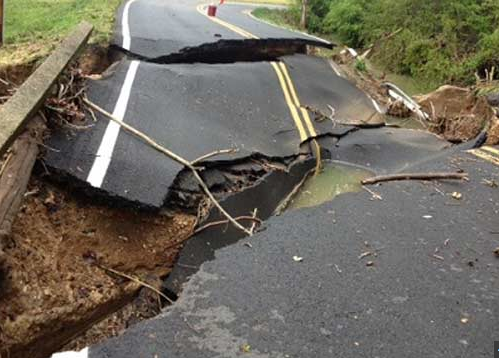 Many roads in western Tennessee are still washed out and impassible due to the heavy, rapid rainfall that caused some major flooding and damage to roadways, homes and businesses Saturday night into early Sunday. In Stewart County, there were six rescue calls wherein people trapped inside their homes had to be taken to dry ground. The new worry on most people’s mind in Stewart County is whether or not the big Cumberland River will flood with the new threat of rain the area is under. West Tennessee is being forecast to get more heavy rain after many areas were swamped at the start of the week. The bad news is that heavy, steady rainfall is expected Friday night into Saturday. The National Weather Service says that residents of Huntsville and other communities across the Tennessee Valley could get three inches of rain with some areas getting up to four. A flood watch is in effect from Friday evening until Saturday evening for areas along and west of I-65. Those locations in Tennessee along rivers and streams are already running higher than normal from the last round of rainfall and will likely be the first to have serious flooding problems this weekend. With the ground being nearly saturated, much of the rain will turn to runoff to worsen any ongoing flooding concerns. And, low lying areas as well as those with poor drainage will be more apt to flood. Many rivers in southern Illinois are also above flood stage. That is certainly not good news because that area is being forecast to get two to three inches of additional rain this weekend. That much additional rainfall will most likely send small streams and creeks over their banks once again, just as many residents of southern Illinois were beginning to get their lives back in order again from flood damages incurred last weekend. This April has exceeded the combined statewide rainfall totals for Illinois in May, June and July of last year. The state was impacted by widespread flooding on three rivers last month – the Illinois River, the Wabash and the Mississippi with several locations on the Illinois River reported record high crests.